After a sell-out run at the Royal Lyceum Theatre Edinburgh, nostalgic bookseller Lewis and party-boy Glen are back in this hit gay romantic comedy set in 1980s Edinburgh. 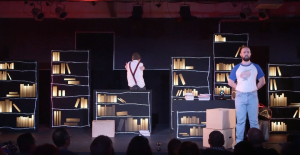 Love Song to Lavender Menace is a funny, celebratory play about the radical, lesbian, gay and feminist bookshop which began in the cloakroom of Scotland’s first gay nightclub and became the beating heart of Edinburgh’s LGBT+ community. On at Summerhall from the 1st to the 26th at 12.55 in Tech Cube 0.